The process of imparting and acquiring the skills, knowledge, and values simultaneously is termed Education. This is the most common definition of education. The essence of education is changing Gradually. The whole concept of education is dissolving and it is becoming more of a commodity. The commercialization of education is becoming the trend. What is it? How did it come to the main picture? 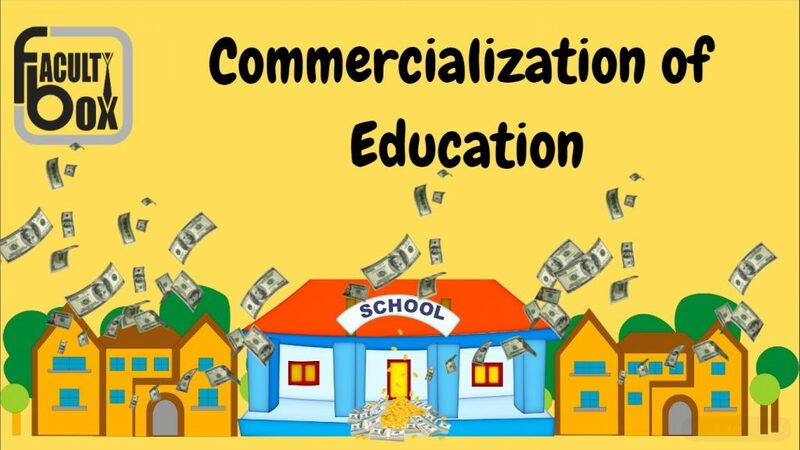 The “commercialization of education” is a way of disrupting the conventional methodology. These are done by introducing commercial activities like an advertisement, with the sole purpose of generating more profits. How the entire transitions from educations to the commercialization of education come? Earlier, education was considered to be the purest profession. Starting from the Gurukulas age, education was the most self-less profession. Now that tag of the noble profession is getting contaminated by these external factors of the business. Let us explore why. From the journey of self-less education to the commercialization of education, speaks a lot. This takes us to the initial stage of privatization. During the 90’s with the advent of LPG era, education industry started becoming commercialized. The profit aspect got linked with the brand name. This statement is evident with the fact that one can find more than 100’s of engineering or medical colleges in each state. The purpose is being the profit-making. Since education is the basic need of the human being. Moreover, the owners sensed that parents will never compromise on their children’s education. This is where the slab of fees started growing. Not only are the colleges, to afford basic education in schools parents need to pay some huge amount. Off-late, many of us came across the fact that even the kinder gardens are exploiting the working parents. Where is our education system going? The trend says that the quality of education is directly proportional to the fees the institutions acquire. The “smart-school” concept is paving the path for commercialization of education. Gone are those when education was accessible and affordable. According to article 21A of the Indian constitution, the children under the age group of 6 to 14 years can acquire free education. But these are not applicable to private institutions. Is it not unfair? Why the private institutions are commercializing the education? Many people came for its support stating that private institutions provide quality of education with advanced facilities. Hence parents are also shelling lots of money. Therefore the commercialization of education became the trend. It is very much clear that the commercialization of education is subjected to the consent between institution and parents. Due to some fear, the parents are also paying what the institution is charging. The commercialization of education has disturbed the status quo. People started comparing the institution with their status. This created a very thick line of difference between public and private schools. The privatization has sown the seed of private schools and colleges. Since the government institutions were not able to meet the expectations due to insufficient funds. The education system in India has been improved over time. The government institutions like IIT’s, Nit’s or NIFT’s were not sufficient to fetch the students need. There come the private institutions in the picture. These private institutions started gambling. If the students are not able to get admission to government institutions, they charge huge amount and provide admission. The motive is not to provide quality education rather earn money. Talking about the commercialization of education without talking about Kota, Delhi, Hyderabad or Mumbai will not serve its purpose. These mentioned cities in India have turned education into a business. The rise of coaching centers is an example of the same. The coaching center owners sensed the gap and came up with the business idea, which is fetching them the excellent result. The commercialization of education has completely altered the purpose of education. The primary objective of learning has changed. Sine this concept of education is seeking extremely high fees. Underprivileged students do not find a better way to acquire knowledge. This results in increasing unemployment. Not only this, the commercialization of education has projected a very negative picture of education. The “education not for sale” is true. Some institutions are there which give a degree in exchange for money. This declining value of education is engulfing the ability of the students. The students nowadays have nourished “for granted” mentality. This is what the private institutions have done to the students. All private institutions have degraded the value of education and can see an improvement in the quality of the education system. In the end, motive remained the same. Profit!!! We have come across people saying, “Education Not for $ale”. The noble profession is changing with respect to the time. The commercialization of education is visible to everyone yet the complaints remain unheard. The prior objective of private institutions was to accommodate those students who were not able to make it to the government institutions. Later, the entire concept got infected by the infusion of profit aspect, the so-called commercialization of education. The war between the private and public institution started. The fees started hopping and the underprivileged started suffering. Interestingly, education has become a commodity. As the prices of the commodity with government policy has increased, education is getting expensive as well. Someone has quoted a beautiful line, education can change the world. But if the system is getting commercialized by the change, can it be able to satisfy everyone’s need?